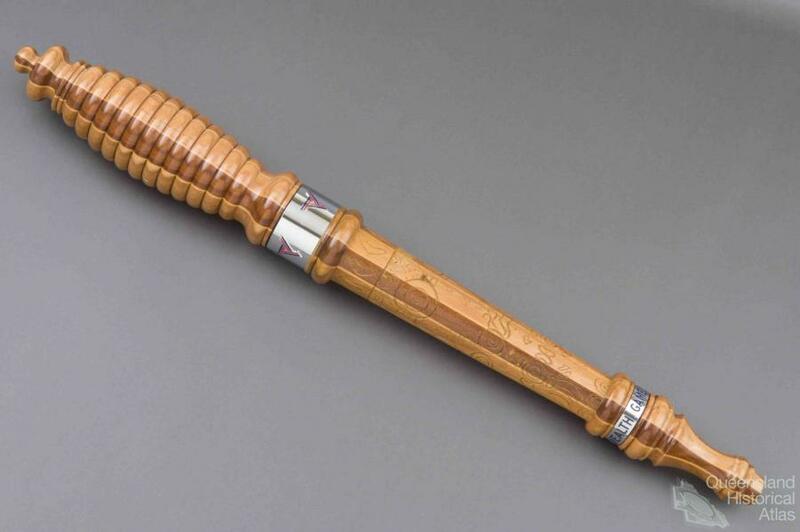 This is the relay baton that carried the message from Her Majesty Queen Elizabeth II for the Opening Ceremony of the XII Commonwealth Games held in Brisbane from 30 September to 9 October 1982. It was made from a composite of eight species of wattle (acacia), the country’s national floral emblem, sourced from all states and territories of Australia, including Brigalow (Acacia Harpophylla) from Queensland, sourced through the Queensland Forestry Department. It has been embellished with Australian silver, sapphires and amethysts. The 12 rings under the silver crown symbolise each country where games have been previously held and represent harmony; the incised boomerangs symbolise visitor's thoughts and experiences, and the return of the Baton to Brisbane at the end of the message relay. The design of the baton, based on concepts of Aboriginal fighting clubs and message sticks symbolically linked the traditional Australian culture with the Queen's relay. Since 1958, the message for the Opening Ceremony of the Commonwealth Games has been delivered in a specially designed relay baton with a hollow centre. This baton containing the message from Queen Elizabeth II began its journey to Brisbane at Buckingham Palace, London. The relay covered 15,000 kilometres and arrived at Queen Elizabeth II Jubilee Sports Stadium in Brisbane at 4.30pm on 30 September 1982. It was opened and the message read out at the Opening Ceremony by the Queen’s representative, HRH the Duke of Edinburgh.